The LEGO Super Heroes theme was introduced in 2012 and comprises of two main sub-themes, DC Comics and Marvel. DC Comics is based on Batman, Superman, Green Lantern with appearances from Wonder Woman and Flash. The Marvel sub-theme is based on the Marvel Cinematic Universe, Spider-Man and X-Men. 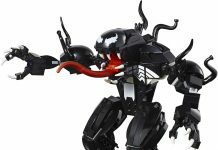 LEGO have also released buildable action figures, known as Ultrabuild sets. These differ from traditional LEGO sets as they use a different building system. There have also been seven video games released; LEGO Batman 1, 2 and 3: DC Super Heroes, LEGO Marvel Super Heroes 1 and 2, LEGO Marvel’s Avengers, and LEGO DC Super-Villains. 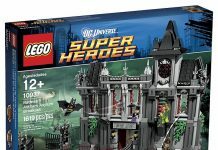 Fun fact: Although the LEGO Super Heroes theme was officially released in 2012, there were actually giveaway sets in July and October of 2011 for Comic Con. 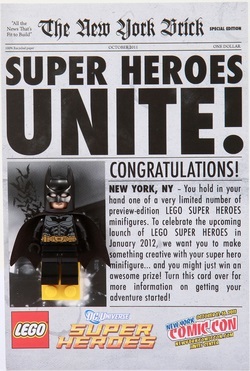 A card as pictured below was made to look like a newspaper and featured minifigures for Batman, Green Lantern and Superman. 1500 of the Batman and Green Lantern exclusive sets were given to lucky raffle winners at the San Diego Comic Con in July 2011. The Superman version was given to fans at the DC Comics booth at the New York Comic Con in October 2011. As you can imagine all three Super Heroes minifigures are valuable among collectors and hence fetch a hefty price tag today.